At first glance, our fridge doesn’t look so bad, but let me tell you, it is so dirty. Cleaning it may look like it’s a really big job, but I promise you it isn’t. 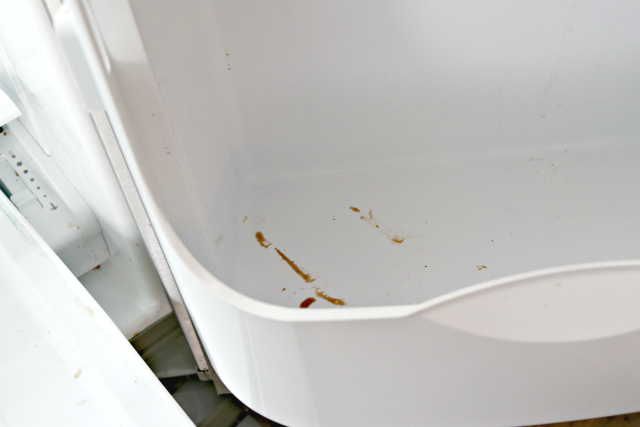 Let me show you How To Deep Clean A Refrigerator In 15 Minutes, and mark that baby off of your list! 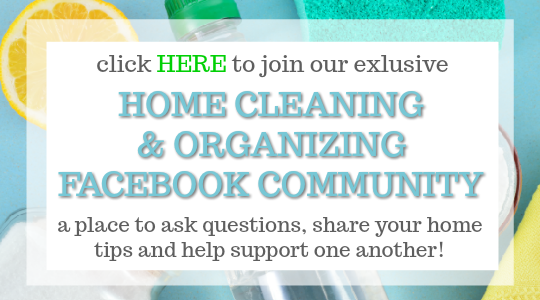 If you are here from our Home Cleaning and Organizing Facebook Group, welcome! If you haven’t joined our group yet, and want to learn more about it, you can find all of the information about our Home Cleaning and Organizing Group HERE! We just got started last week and are already up to 754 amazing members who are already helping each other by answering cleaning questions, sharing tips and encouraging each other. Today, we are starting our first challenge, cleaning and organizing our kitchens, and we are starting with the refrigerator. So, come join us and let’s get our kitchens clean! The kitchen is often said to be the heart of your home. That’s definitely true for us, and if the kitchen is the heart of the home, then the refrigerator is the main hub. It holds most of our food and drinks, and I bet ours is opened and closed a gazillion times a day. 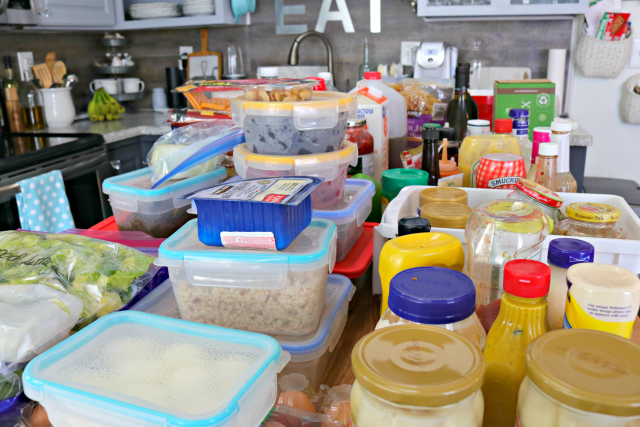 When your refrigerator gets too full and cluttered, it’s hard to know exactly what foods you have, and also harder to plan meals. Getting your refrigerator clean and organized will make meal planning, lunch packing and healthy snacking so much easier. Let’s get started! 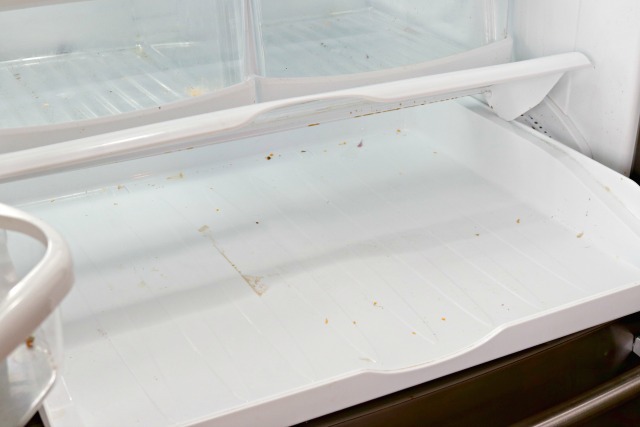 The first thing you need to do is empty your refrigerator out completely. This is a good time to throw out any old or expired foods, throw out any old leftovers, and take inventory of things you may have multiples of. 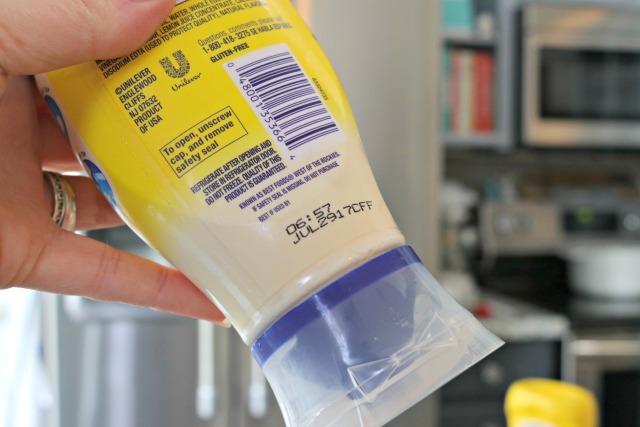 Be sure to check the expiration date on all of your condiments, sauces, salad dressings and any other packaged items. Don’t forget to check your pickles too! Now onto our dirty little secret…well, not really a secret, but it’s definitely dirty. This is our meat and cheese drawer. We mostly use it for cheese of all kinds, lunchmeat, hot dogs, sausages and bacon. This drawer gets a ton of use, obviously. This is one of the shelves inside of our fridge doors. Can you guess what used to be there? It was BBQ sauce…we have a sick obsession with different types of BBQ sauce. Now that you’ve seen the filth, let’s move on. Start by removing any pieces that can be removed, except for the main shelves. Remove drawers and any door shelves that you can, and place them near your kitchen sink. Some older models don’t have the option to remove the door shelves, so if you have an older model, no worries…just remove the drawers. Our meat and cheese shelf is kind of hard to remove, so I just left in place. Now, grab a large bowl and add two tablespoons of dish liquid to really warm water. You will need to grab a clean cloth or sponge too. Gently scrub all surface areas. 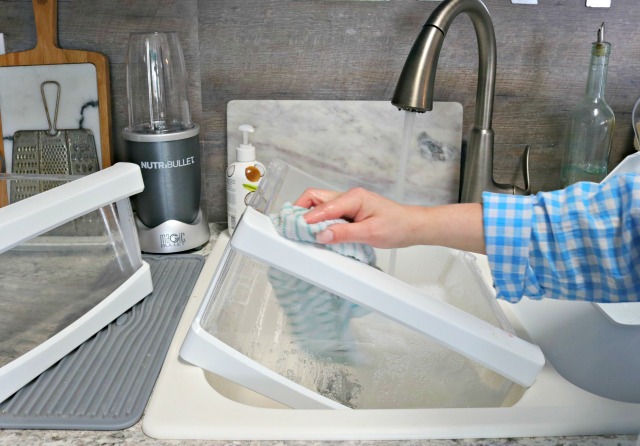 You may need to use a scrubber to loosen and really tough food spills. Be sure to lift the glass on the shelves if they are removable and clean under the lips of the glass and where the shelves rest. 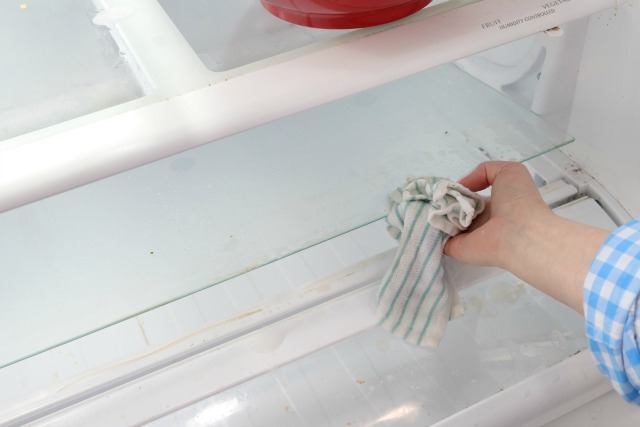 Once you have wiped down the inside of your refrigerator with the soapy mixture, use a clean towel to dry and remove any moisture. Time to clean those drawers. Simply take your soapy mixture and use it to clean the insides and outsides of your drawers and removable shelves. Rinse well and dry with a clean towel. 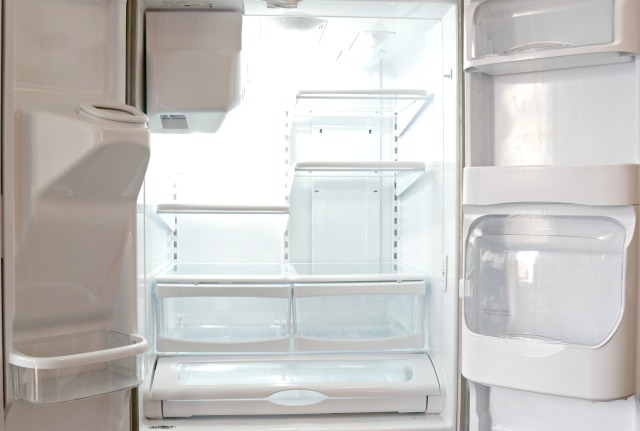 Put all of the clean pieces back into your refrigerator, then stand back and admire your work! 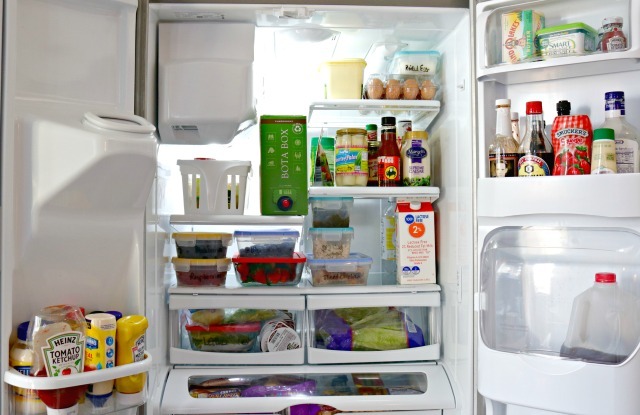 I’m telling you, once you’ve completely cleaned out your fridge, you will be so happy that you did! 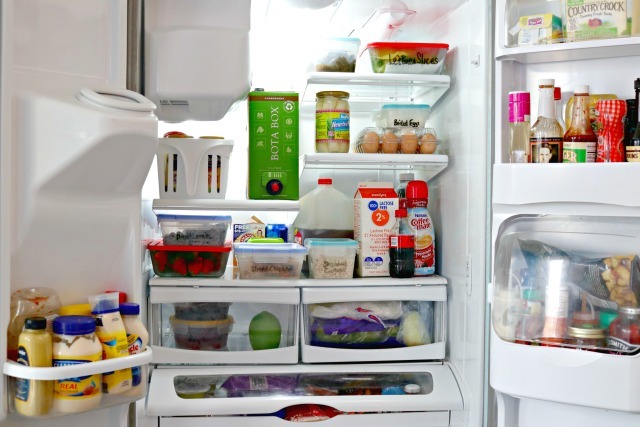 Cleaning our refrigerator always feels like just the jumpstart I need to be more aware of the foods that I am eating, and it’s the perfect time to organize our refrigerator so that it makes more sense. 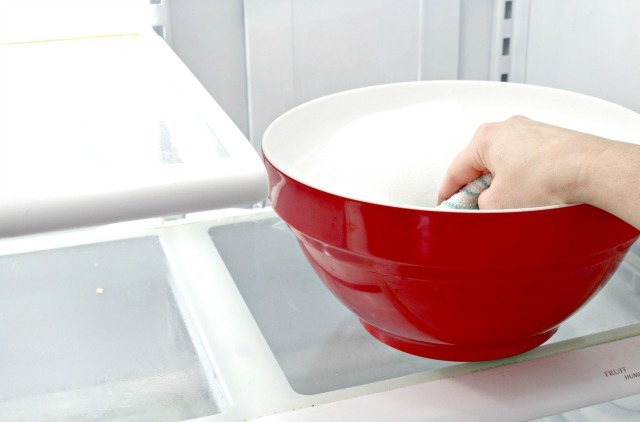 Now that the inside of your refrigerator is clean, give the outside a nice wash down with some warm water and dish liquid. For tough stains, you can use a Mr. Clean Magic Eraser to remove them. 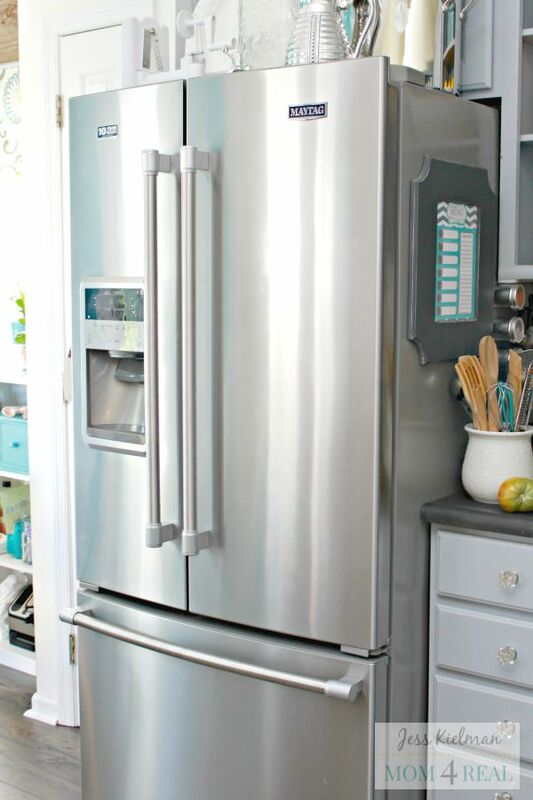 If you have a stainless steel refrigerator, fin How to Clean Stainless Steel Appliances and keep them fingerprint and smudge free HERE! Now that our refrigerators are clean and organized, we can move on to the rest of the kitchen! Next up, pantries and countertops! Do you leave the fridge on while you are cleaning all the parts? I guess you can close the doors as you wash each part in the sink. Thank you for all your wonderful tips!!!!! and tidy fridge and freezer. Hi Jessica! I also use baking soda on hard “stuff” that needs a little scrubbing. I wrap the glass shelves with press n seal too. I keep relish,mustard,ketchup etc in a plastic square container with a handle. It fits on the shelf door. When I am making sandwiches I grab it and no juggling bottles to the counter. I have a turntable too on one of the shelves and it makes it easy to get to things. Love your blog and use a lot of your ideas! Ps you looked great on Rachel Ray ! 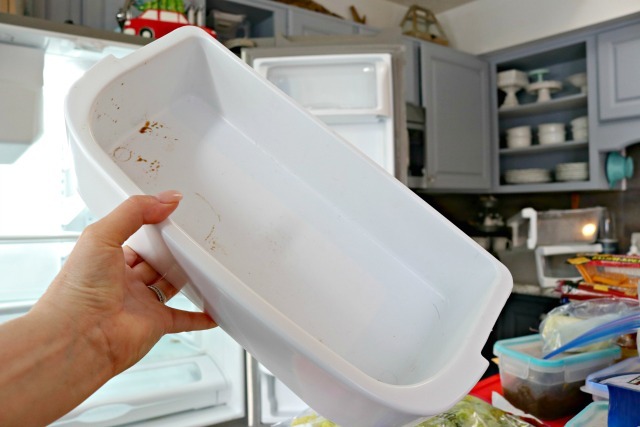 Make sure you wipe off the bottoms of containers before you place them back into your frig, they are sometimes dirty too. I bought clear plastic and made my own shelf liners for the shelves and the door bins. I take everything out, remove the liners and place them in the sink with hot water and dishsoap. I just have to wipe the edges of the shelves and bins. While the liners are soaking I quickly wipe down any messes on the bottles or containers and dry them. (I check everything at this time for spoilage/expiration). I then wash the lines and dry them, place them back in their place and return all the food. This makes everthing so much easier and faster to clean. What did u make the liners out of? I also find that it keeps your fridge cleaner if you use paper napkins folded to the width of the door shelves where you keep things like BBQ sauce, mustard etc. that way if something tips soon after you clean your fridge you an just to take out the soiled napkin & replace it! ???? Wow, thank you for these helpful tips. I love the way you arranged everything after you cleaned everything. Thans for sharing. Sound advise… But 15 minutes? Impossible. Right?! It takes me longer than 15 minutes just to empty everything out! I would like to put my frig on wheels, when it time to clean, wheel it outside and hose it down. Since I don’t have that option, I am very lucky I have a 7 year old granddaughter who guess what, “LOVES TO CLEAN THE REFRIGERATOR”. Can you believe that. so we make it simple. she cleans one section shelves, drawers etc. one everyday. She can only stay 7 for so long and I don’t want to burn her out. I do my deep cleaning once a year where I live in Wisconsin. I put the freezer foods in the coolers and put it outside when temperature get below zero. Then I do the deep cleaning of the fridge and freezer. Occasionally, I wiped down the shelves in the fridge during the rest of the year. I also make note like Heather LaDieu has said of where to put your shelves back to the fridge.